Finally! It has been driving me bonkers that my command center--ground zero of home organization--was not organized. Our amazing carpenter, Joe Yoder, designed the command center for us, unlike the kitchen, which I detailed pretty well for him. We didn't have a kitchen desk in the old house, so it was all new. All I knew I wanted was one place to keep everything I need to run the house, and the ability to keep everything tucked away. Joe came by a few weeks ago to put a center support in the bookshelves. Since I had to clear everything out to let him work, I refused to just drudge everything back. There would be ORDER! I started by putting my cooking binders and cookbooks on the bottom of the two shelves. I decided that the top shelf would be great for family photos. No more staging for me. My house will look like a home, not a model! I got the idea to use post it notes to test out placement of different items to see how they worked. I started out by making labels for the little cubbies. I used a piece of scrapbook paper and stickers from the dollar bin at Target. Memory. This is the memory box where I keep all the cute things I want to remember. It's a new thing I'm trying. The idea is that at the end of the year, you can read all the fun things that happened over the year. Glasses. My neuro-opthalmologist wants me to wear my prism glasses whenever I'm looking at a TV, driving, exercising, or doing anything that requires looking in the distance. She also wants me to wear my reading glasses when I'm on the computer. I always forgot because it's a pain to constantly switch my glasses. Hopefully, this will help. Coupons. We buy most of our food in bulk, so I don't use a lot of coupons, but I do keep ones for the craft stores, Bed Bath and Beyond, and a few other things. In. This is the mail that comes in before it is filed or processed. Usually it means I have something to show/ask Niels. Pending. This is the larger opening. I put my daily-do list there, as well as anything that I'm waiting on something to complete. Out. This is where I put bills to put in the mailbox or other things that need to be mailed or delivered. Envelopes. Yep, that's what it is. HSA. Niels, saint that he is, takes care of our HSA statements. I plan to stick my medical bills in there and let him magically take care of them. House. Because our house is new and we like our builder, and because we really appreciated the home owners who let us see their homes, we let prospective Charis home owners tour our home. This is where I keep flyers and business cards for our cabinet maker. It's hard to get a picture of the whole command center. It's about 9' long and 9' high. It's recessed into the wall, so you don't see it from the great room or mudroom, which is nice, if, hypothetically speaking, it wasn't neat and tidy. Now for the tour. Starting with the left side cabinets, there are three shelves, 2 with small bins, and one with binders. As you can see the big binder sticks out a little. If I were doing it again, I would make the cabinet an inch or so deeper. The binders hold our owners manuals, warranties, and every selection we made on the house (appliances, paint colors, flooring, etc.) The thin blue books are my copies of the book I wrote for my son. The top basket is for projects supplies like puffy paint and glitter that I want far, far from little boy hands. The second basket has house hold papers like receipts and promo materials that need to be filed in our house binders, and papers about projects we still need to do, like landscaping. The basket holds the power cable for the printer, as well as extra ink. If you look closely, you can see that we have two outlets in there. One is for the printer (there's a hole to the right of the cabinet for the cord) and the other is for the LED light. We should have put 4 outlets, with the face sideways. Originally, I wanted to plug in my camera charger there, but if I do, it's so long that I can't use the other outlet. It's not a big deal at this point, and I can always use an extension cord later. There's another bin on the shelf below the basket, which I labeled "sort-do-file." What it really means is, "Someone is coming over and I want to look organized, so where can I put this pile of papers?!" Voila! I know I'm going to do it, so let's just be honest about it and make a space for it. Down to the drawers. The top drawer is for computer paper. We try to recycle paper unless it has to be clean, new paper. My current solution is to use foil pans for dividers. Second drawer: sheet protectors and labels in more foil pans. Third drawer: bubble envelopes and plastic folders. I use these folders for individual projects. For example, right now I have one for landscaping. If you look closely, you can see that I have a piece of masking tape on the bottom. I write the project on the bottom, and then put any paper on the subject inside so everything is in one place. Bottom drawer: magazines to read. There are two rows of drawers on each side. The outer drawers are wider, and the inner drawers are narrow. Top drawer: photo paper. Second, third, and bottom drawer: my shredder. This is one thing I knew I wanted and asked Joe to incorporate. The shredder slides out when needed, and because there is an outlet against the wall, it never has to be unplugged. Above the desk and under the cubbies are two magnetic dry erase boards. The one on the right is my prayer board and memory verse for the month. You can see the angled outlets from this angle. They are hidden if you are standing up. The other board has info on upcoming evens, my daily reminders and a milk allergy cheat sheet. I have two large shallow drawers under my desktop. I put two jewelry dividers in the one on the left to hold all the little accessories of the office: magnets, push pins, rubber bands, etc. The right drawer has all the essentials: pens, sharpies, note cards, etc. The narrow row of right drawers, starting at the top: all the cords and my helpful assistant, my labeler. Second row: connectors, for a lack of a better word. This drawer holds my stapler, hole punch, tape and glue. Third row: stationery, because I intend to get back to writing letters. Bottom drawer: D's drawer. A place for my son's office supplies. Right outer drawers, from the top: Important info--all the things I need to find regularly in one place. Second row: notepads, because I am forever making lists. Bottom row: projects. Here's the envelope with all my drafts of my book, plus the start of the follow up. Right cabinets, on top: two more bins and a row of binders. The binders contain our medical files. On the door is a list of all my doctors. The top bin is for (small) projects in process. Mostly pictures waiting for frames or canvas. The bottom bin holds our library books. This forces me to not check out the whole library at once. The bottom cabinet holds our budget binders, planning calendar, menu planning binder, little bins with everything I need to pay bills, and our receipt jar. On the top of the command center, I have four clocks waiting for batteries. There is a clock for each time zone where our extended family lives. I bought the clocks at Target, and put sticky letters on them. And lastly, on the top bookshelf, I put a few family photos. I'll update them eventually with different frames, but that will require more boxes to unpack first. Make the shelves a little higher to allow two rows of books, if wanted. As it is, I have room for one row of books/binders, and only a shallow shelf above. It works, but I would have liked the flexibility. Four outlets, instead of two in the cabinet, and placed sideways to allow for larger plug-ins to work. If you liked this post, we'd love for you to follow us on Facebook and Pinterest. I finally have my clocks up! You can read all about it here. Thanks so much for linking up to our Cinch party! Thanks for stopping by. That was one of my first links! I am staring in shame at my cluttered desk! This is seriously amazing - and it's motivating me to get cracking! Wow, now THAT'S organization. Thanks so much for sharing this at our party. What an amazing project! 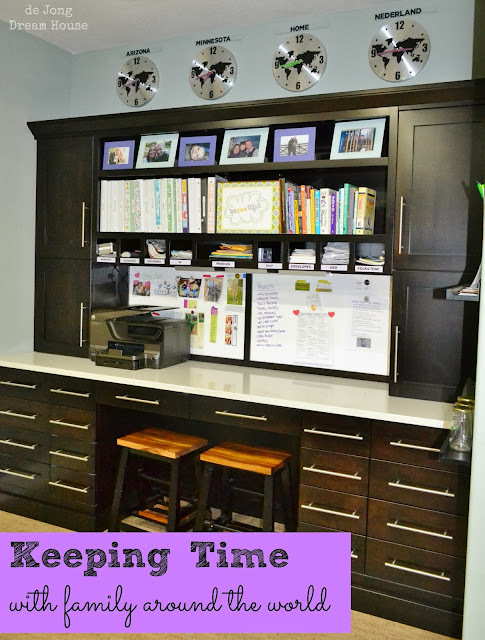 Perfect for organizing a busy family. Thanks for the inspiration. Would you be able to lower the shelf that holds the printer cable basket, and plug the camera charger into the bottom socket of the outlet in order to use the the top socket for another plug? This is a great command center! Carole, what a great suggestion! I'm going to try that! I just started moving into my new desk this morning, so I really enjoyed seeing how you have yours set up. I was looking all over for ideas when we were moving in. Glad this post was helpful. Congrats on the new desk! Those clocks are very cool! I'm just extremely jealous of your command center. WOW! Great organization too. This is FABULOUS! WOw I'm jealous. LOVE IT!